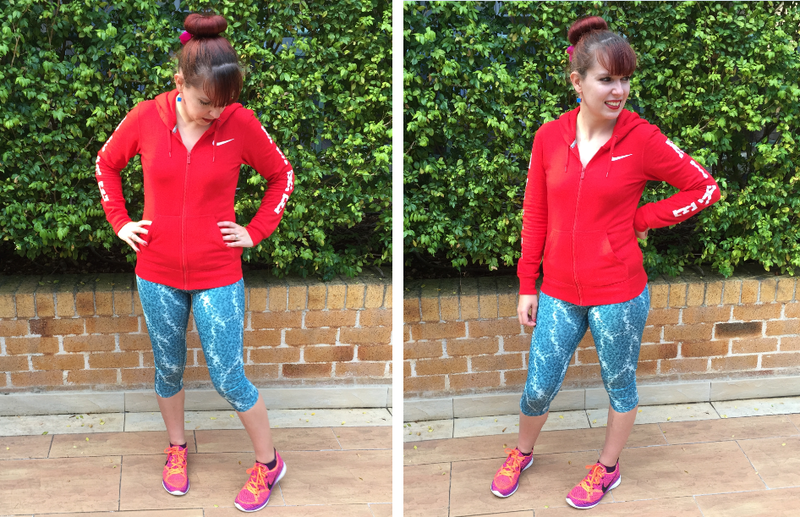 Today I have a different style of “outfit” post which involves some of my favourite sportswear. Since sport is such a significant part of my life at the moment I’d like to represent it more on my blog in addition to just the fashion side. Since my main sport is swimming I’ve built up quite a swimwear collection but there’s still a lot of time spent in gym wear style clothes. I used to not really care what I wore when exercising but since it’s become part of my lifestyle now my opinion has changed. I really like sports related products and it’s now a competing interest with my love for clothes and shoes. I thought I’d show you a few of my favourite outfits in this category. It’s starting to become my weekend wear also. 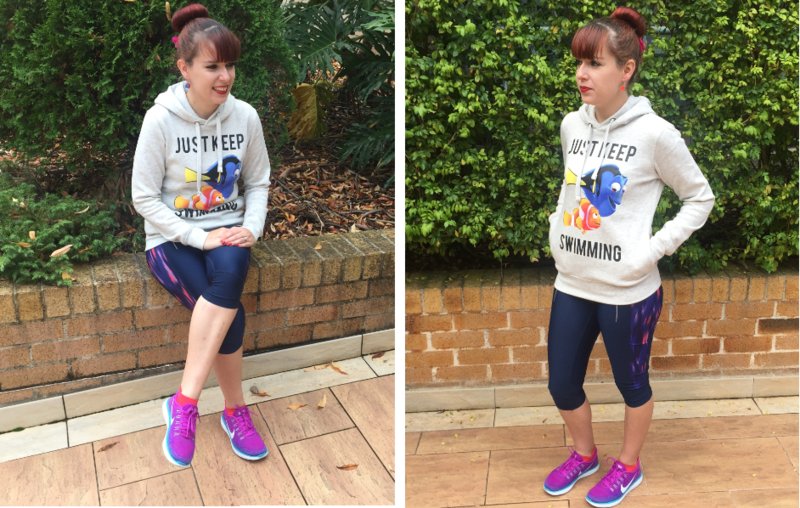 The ‘Just Keep Swimming’ jumper is a recent purchase from JayJays and I thought it was very appropriate given the amount of swimming I’m doing. One of my goals is to achieve an award with Masters Swimming Australia of swimming one million metres so this jumper represents the fact that every small part counts. 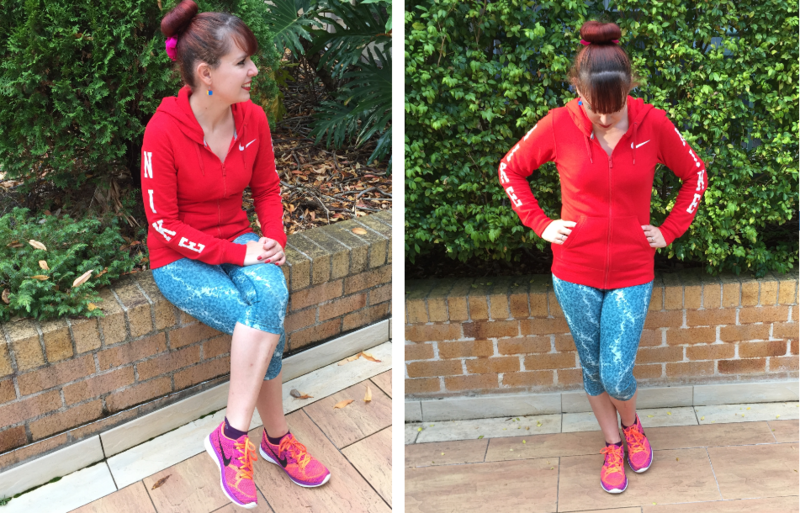 The leggings are from Kmart which is undoubtedly my favourite location for gym wear. I can’t believe the incredible prices and I also like the quality. Money aside, I would still prefer the leggings in Kmart to those in Adidas or Nike, mainly because they are a tighter fit. My shoes are the ‘Nike Free Run.’ I usually run in my other Nikes (which are pictured in outfit 2) but sometimes use these for other training and if I need a comfortable pair of shoes for walking around on the weekend. I also wear them for runs in wet weather because the knitwear texture of my other running shoes isn’t great for the rain. This is an outfit I wear to the Parkrun or to bootcamp style training (although I’d lose the jacket fairly soon into it). I love these leggings because they are my only coloured ones. They come in a matching set and I am wearing the top underneath. The brand is Puma and my sister bought it for me last Christmas. I’ve had so much use from it especially since I didn’t own too much good sportswear at the time. The Nike jacket is from one of my many shopping trips to Rebel sport. I’m often not a huge fan of Nike when it comes to clothes (generally favouring Adidas for clothes and Nike for shoes) because they are overpriced and the jackets are not very warm. However, this jacket seems to be an exception. It’s fleece inside and I got it in the buy one get one half price sale. The shoes are the ‘Nike Flyknit Lunar’ which I purchased a few months ago when I became more serious about sports. I wanted to do everything possible to minimise the chance of injury again which was also a good excuse for new shoes. I’ve been happy with both my pairs of Nikes so far. I’d typically wear this outfit to and from the pool on a day I have swimming training. Although I have quite a few sports jackets, this Adidas toucan jacket is by far my favourite. It was a gift from my parents for my birthday and I love it. The toucan design is so unique, fun and colourful. I also like the siganture Adidas elements especially since I am a huge fan of jackets by this brand. The Skechers were also a birthday gift intended for use around the pool. It’s often hard to know which shoes to wear to swimming since they need to be easy to slip on and off, able to get wet and be warm. This pair certainly fit the criteria and it’s a bonus they are pink too. The leggings are another pair from Kmart which also come with a matrching purple and grey top. Finally I only ever wear these sports socks from Reebok. They are very slim lined and don’t bulk up the shoe. They come in a few different colours as you can see from all three of my looks here. What are your favourite outfits for sports? This entry was posted in Adidas, Fitness/Sports, Lifestyle, Nike, Outfits. Bookmark the permalink. The blue jacket in the last photo is wonderful! I like so much the look number 3! These are all great outfits, Imogen. I love that Finding Nemo sweatshirt, and the Adidas toucan jacket:D And your weekly schedule is very inspiring…way to go! Absolutely adoring Outfit 3, Imogen! 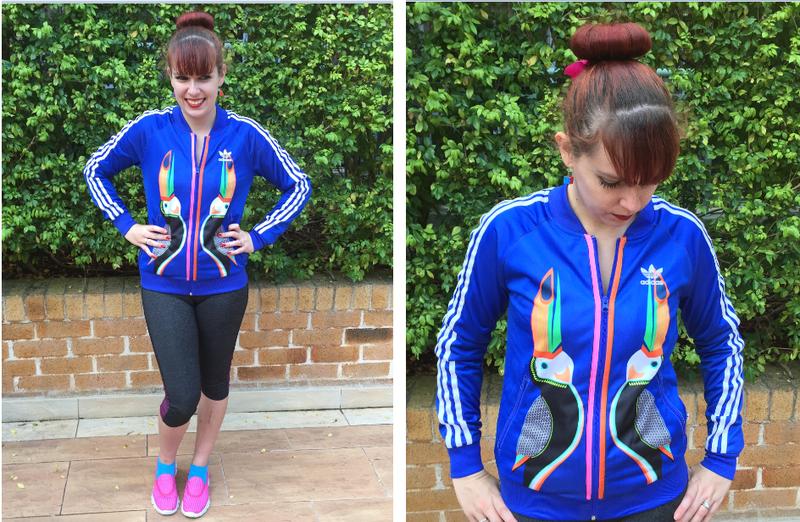 That Adidas Toucan Jacket is too cute! Its fun to see you in sportswear but I have to say that you look super cute in these outfits! Oh an by the way -somehow I cannot see you following on bloglovin 😦 otherwise I would alredy have followed back! Hehe how adorable is the keep on swimming sweatshirt. I love Finding Nemo! I love sports wear too! 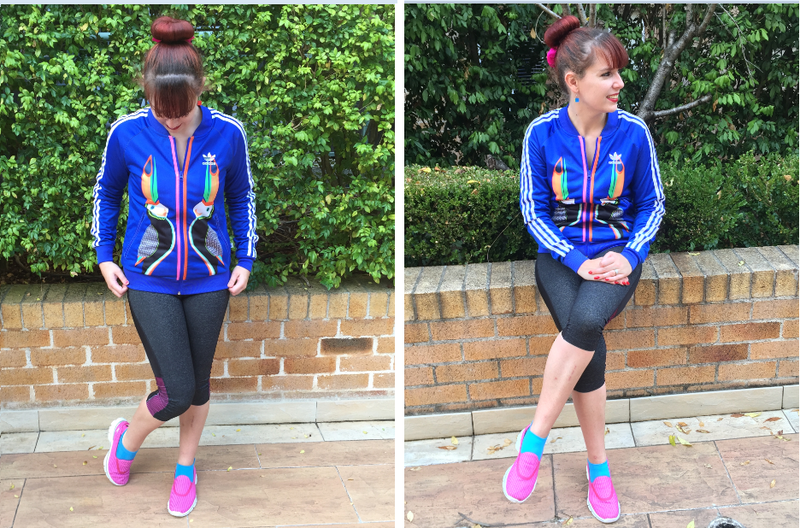 All I want to do is buy new workout gear, haha, love your colourful trainers! The Just Keep Swimming hoodie is awesome! Love the working out looks! Perfect! your working out outfits are fabulous! I love how you stayed true to your love for colours. 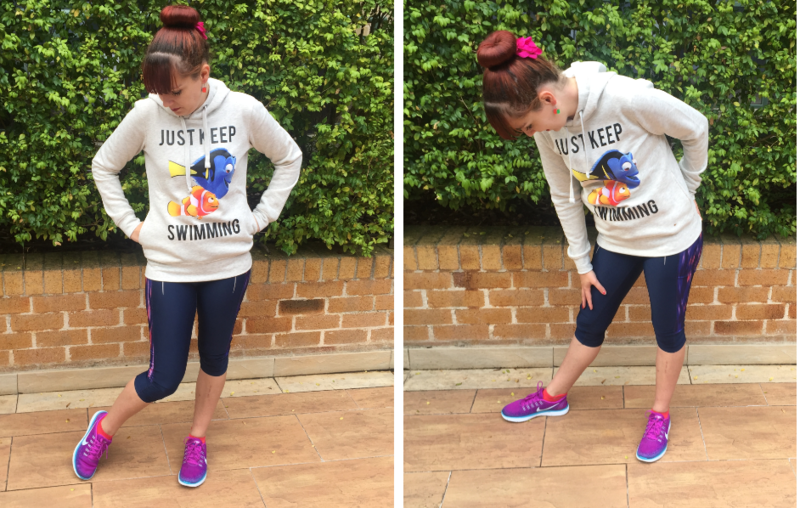 Love the red and turquoise outfit and the Just keep swimming jumper!